This activity hails back to my days as a field studies instructor with an outdoor education company where 'smelly potions' was one of the sensory activities we did with the younger guests. 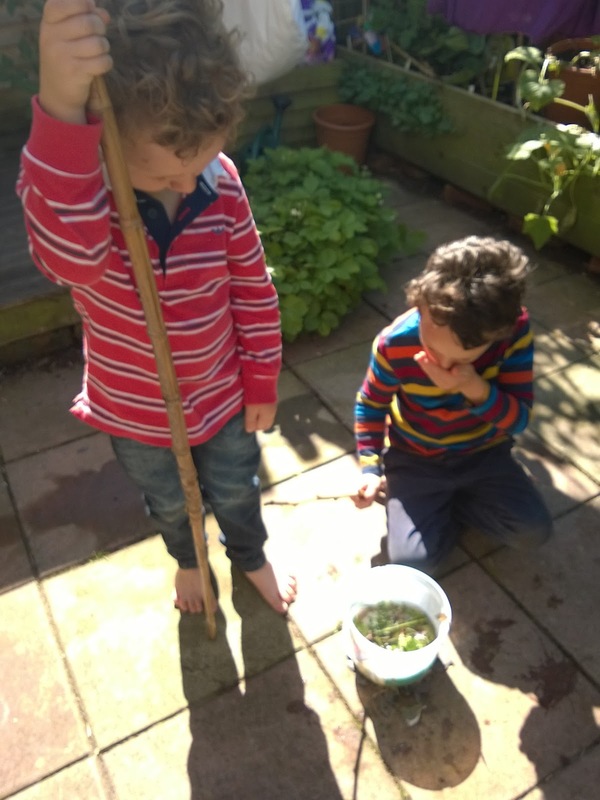 All you need is a container of some sort - we used a 1kg yoghurt bucket - plus a little water and an area with an assortment of safe weeds and herbs to pick. If you don't have an outdoor area, you could replicate the fun using old herbs, spices, food colourings and other store cupboard ingredients. The aim is for your child to really use their nose to select ingredients for their smelly potion - encourage them to pick a small amount, crush it and smell it and then decide whether it goes in or not, and if they need more. It's not just a grab handfuls and make gunge activity, although this is fun for younger ones too. Into our stinky pot the boys added herbs such as thyme and mint, but also tomato leaves which they decided were particularly potent smelling. It's good to encourage gentle picking of small amounts of materials. If you don't think your kids are old enough to understand this, stick to lawn weeds you don't mind them beheading in quantity. After a good old stir and sniff, including 'cooking' over a fire made of stone chips, the contents were added to the compost heap for the worms to enjoy. You can get a useful insight into their thoughts by asking kids to decide what the potion is for - is it a magic flying potion, a medicine, a monster repellent? My boys decided it was skin cream to make your hands nice and soft (perhaps influenced by them watching me making up creams - singing to the beeswax, honey and oils as I make up bottom butters and skin balms for friends and family). This activity is great to encourage the use of kids senses and is also a useful inclusive activity for children with impairment of eyesight or hearing or mobility problems. Since Ollie seems to have picked up a nervous habit of constantly smelling his hands I've also been trying to give him things to do using his sense of smell that don't involve him having his hands plastered to his face. At least he's not chewing holes in his tops now I guess. Safety: usual common sense - supervise and assist kids doing this activity so you don't end up with them decimating the flower borders or grabbing poisonous or irritating plants, plus make sure you emphasise this is a smelly potion, and not one for drinking.